Gardiner Street Dublin is one of Dublin’s best known Georgian Streets; Gardiner Street Dublin is historically, culturally, politically and architecturally important due to its unique history some of which is set out here. In May 2011 Britain’s Queen Elizabeth II visited Gardiner Street Dublin and later joined Irish President Mary McAleese to lay wreaths at the Garden of Remembrance. 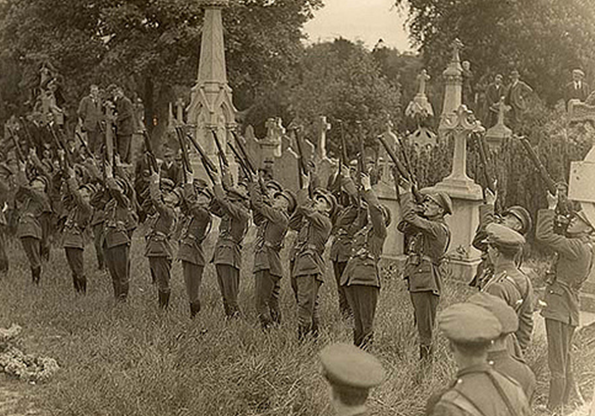 The wreath-laying ceremony at the Garden of Remembrance, which commemorates those who died in pursuit of Irish freedom, was followed by one minute of silence. This visit marked a new relationship between two neighbouring nations. Lower Gardiner street south leads from Mountjoy Square to the fine stone Georgian Custom House overlooking the river Liffey. 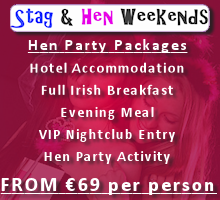 Lower Gardiner Street is home to some of Dublin’s finest family owned Hotels, Guesthouses and Tourist Hostels. 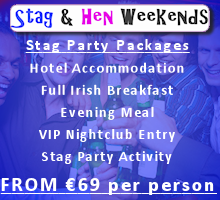 Lower Gardiner Street is renowned for its Irish Hospitality including the Famous Ned Keenan’s Pub. 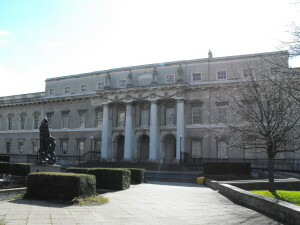 Lower Gardiner Street is a central location and a focal point for public transport and day tour vendors such as Wild Rover Tours, departing The Town House Hotel and Globetrotters Tourist Hostel. The DART line crosses near the intersection with Beresford Place behind the Custom House and this end is only a few minutes’ walk from Connolly station, and around the corner from Lower Gardiner Street is the Luas red-line stop at Busáras. Lower Gardiner Street, is also part of Dublin City Council’s Inner Orbital Route, however, pedestrian crossing points are conveniently located and allow for safe and easy road crossing. Middle and Upper Gardiner Street are separated from the lower street by the west side of Mountjoy Square, a Dublin Georgian square noted for its cultural and historic connections. 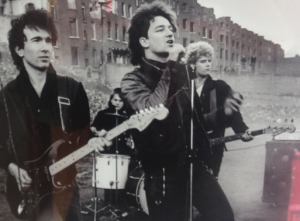 Gardiner Street Dublin has sown the seed of many music legends, Bono and U2 often practiced in the SFX Hall at the site of Gardiner Street Church before they flowered on the world stage. Bob Geldoff and the Boomtown Rats were rooted in their Punk Rock Music in the basement of Moran’s Hotel in Lower Gardiner Street (Moran’s Hotel was at Number 73 Lower Gardiner Street/this picture was taken in 1974). 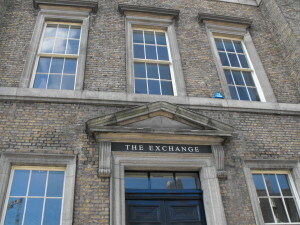 Every Dubliner knows the Historic Labour Exchange Building at 50 Lower Gardiner Street, Dublin 1. But few know it began its life in 1839 as the famous Trinity Church. 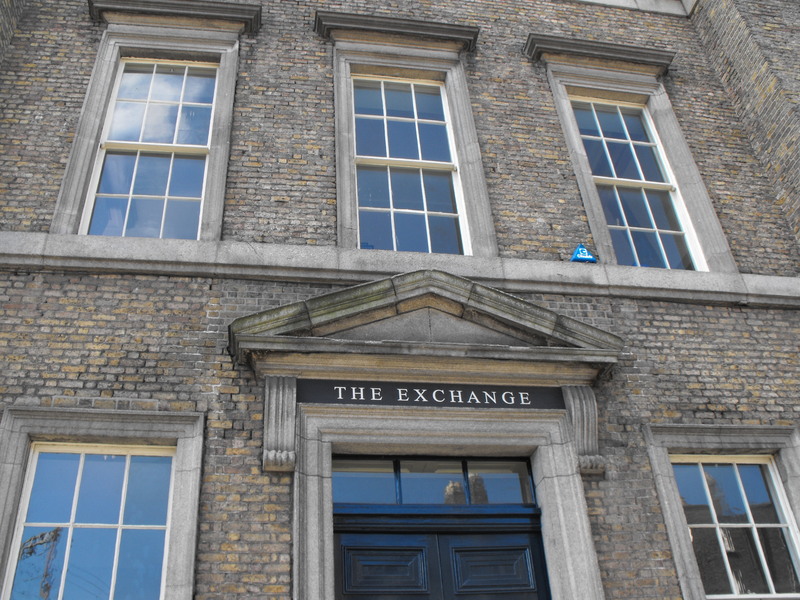 ‘The Exchange’ is Trinity Church’s newly-acquired historic building on Gardiner Street. The original Trinity Church built in 1839, closed in about 1909, and was the Labour Exchange for almost a century. Now the reopened building is a lively centre of celebration and a venue for major city events, for personal restoration, training activities, community support and for the arts. Gardiner Street Dublin would play an important part in the greatest literary work of the modern world, James Joyce, celebrated on Blooms Day each year in Dublin Ireland, was the author of Ulysses which was first published back in 1922, it expanded the public’s preconceptions about what was permissible in fiction despite being denounced as obscene and even unreadable by some critics. These days, Joyce’s labyrinthine novel is widely touted as one of the greatest fictional works of the 20th Century. Gardiner Street and its surrounding network of Georgian Streets would feature prominently in this classic. 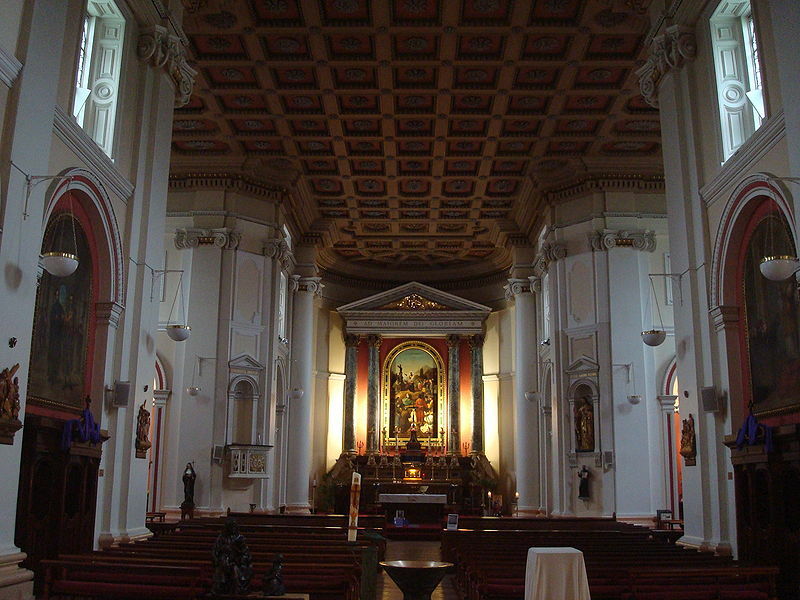 On Upper Gardiner Street is located Saint Francis Xavier Church, a notable stone Classical building dating from 1829 and with a connection to the poet Gerard Manley Hopkins. Gardiner Street has another notable poetic connection by way of featuring in Patrick Kavanagh’s poem “Memory of My Father” (see also, Newman Church). Gardiner Street Church, St Francis Xavier, is home to the Jesuit Order and Pope Francis is the first Jesuit to be elected Pope. Francis (Latin: Franciscus PP [franˈtʃiskus]; born Jorge Mario Bergoglio on 17 December 1936) is the 266th and Pope of the Roman Catholic Church, elected on 13 March 2013. As such, he is both head of the Church and sovereign of the Vatican City State. A native of Buenos Aires, Argentina, he was ordained as a priest in 1969. He served as head of the Society of Jesus in Argentina from 1973 to 1979. In 1998 he became the Archbishop of Buenos Aires, and in 2001 a cardinal. Following the resignation of his predecessor, Pope Benedict XVI, on 28 February 2013, the conclave elected Bergoglio, who chose the papal name Francis in honour of Saint Francis of Assisi. Besides being the first Jesuit pope, he is also the first to choose the name Francis, and the first from either the Americas or the Southern Hemisphere. Portrait of Luke Gardiner, 1st Viscount Mountjoy (1745-1798), half-length, in a beige, fur-trimmed coat, white stock and striped red waistcoat. 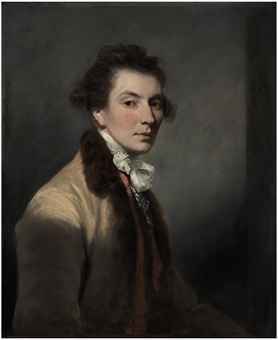 Sir Joshua Reynolds, P.R.A. (Plympton, Devon 1723-1792 London). Sold for approximately £500K at Christies Auction House, London. It was Mid-summer’s Day 1961 that saw the last commercial passage of a Guinness barge on the River Liffey Dublin. 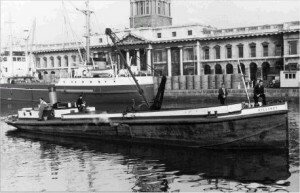 According to Al Byrne in his most entertaining book “Guinness Times – My Days in the World’s Most Famous Brewery”, it was 6 p.m. when the 80-foot long by 17-foot-one inch-wide barge, Castleknock, sailed from the Custom House with a load of empties and slowly made its funereal way up river to the jetty at St. James’s Gate. 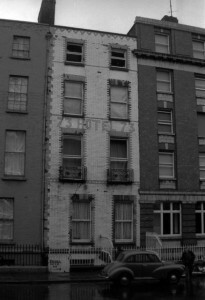 Historic former residents Playwright, producer and actor Dion Boucicault (1820–1890) lived in number 47 Lower Gardiner Street (Now: The Townhouse Hotel). Boucicault was involved with over 150 plays, and is best known for The Shaughraun, yet also wrote “Napolean’s Old Guard”, “A Legend of the Devil’s Dyke”, “London Assurance”, and “The Colleen Bawn”. His mother was a relative of the first Arthur Guinness. Both Seán O’Casey and JM Synge acknowledged him as being a major influence on their dramatic works. Lafcadio Hearn, who was better known to his Japanese friends as Koizumi Yakumo, was born of Irish-Greek parentage in 1850, on the Ionian Island of Lefkas and became. In 1851, when Charles Hearn (an assistant Surgeon in various regiments) was assigned to the West Indies, he sent his wife and infant son, Lafcadio, home to his mother in Dublin who lived at Number 48 Lower Gardiner Street. Rosa, Lafcadio’s mother did not speak English and was treated very much as an alien by the conservative Hearn family. As a journalist and writer Hearn poured out book after book about the land of his adoption. Through his keen intellect, poetic imagination and clear style, he became the great interpreter of things Japanese to the West. During one of Dublin’s most turbulent political periods Gardiner Street played a key role as can be seen from the, “Report of the Dublin Disturbances Commission, 1914″, due to its close location to key Dublin City locations, as well as being the scene of street disturbances relating to the 1913 Strike and Lockout, Gardiner Street facilitated numerous meetings of those involved in the Strike and Lockout including James Larkin. 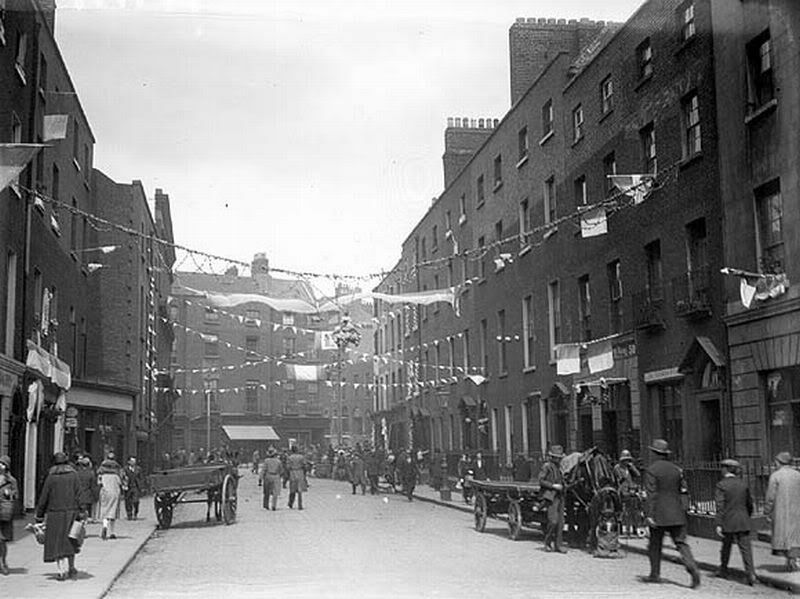 GLOUCESTER STREET, WATERFORD STREET, GARDINER STREET, AND PARNELL STREET, 31 AUGUST 1913. 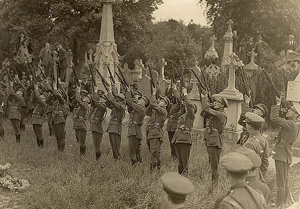 About 5 p.m. on Sunday evening, the 31st August, extensive rioting prevailed in the district around Gardiner Street, and crowds assembled in that street, and at the corners of streets communicating therewith. In the first instance the police came into contact with the rioters at the corner of Gloucester Street, and dispersed them after being met with a fusillade of stones and bricks, in many cases thrown from houses. A number of troopers were engaged in keeping the crowd moving, but their efforts were greatly hampered by the persistent stone throwing that took place from nearly all the houses in the streets through which they passed. In some of the streets, notably Cumberland Street and Waterford Street, numbers of men were stationed on the roofs of houses, and stripped off slates and tiles for the purpose of throwing them into the street at passing constables. In one case in Waterford Street seven men were discovered on the roof of a house. This disturbance was spread over the entire district, and the serious feature of it was the readiness of the occupants of the various tenement houses to shelter escaping rioters, and to join with them in attacking the police from the upper stories of many houses. Some baton charges were made, but as a rule these were useless, as the crowds fled before the police and took refuge in houses which were open to receive them (Report of the Dublin Disturbances Commission, 1914). 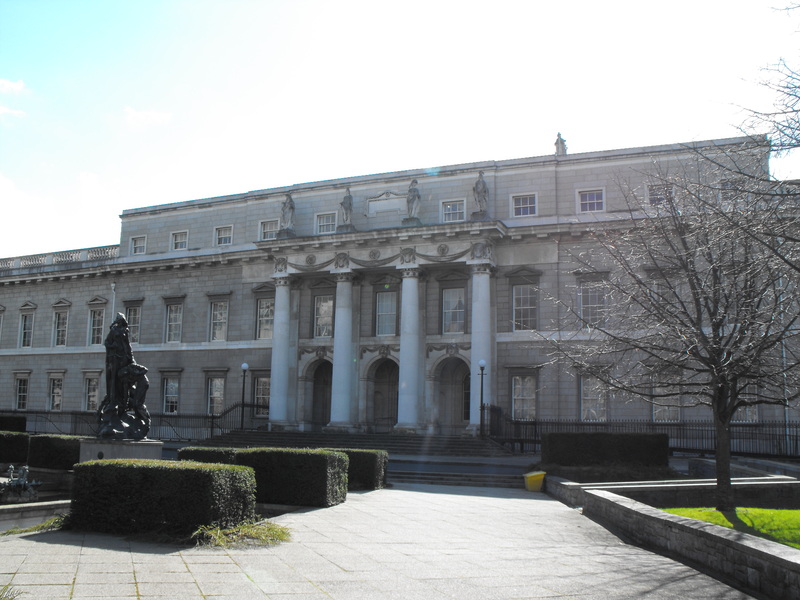 The Jesuits had been in the Hardwicke Street area since the 1730s, on the site now occupied by the Sacred Heart statue and had opened a school there which eventually moved into Belvedere College in 1841. The first Mass was celebrated by Archbishop Murray, who presented a chalice which is still used. The work of the Religious Sisters of Charity in Gardiner Street Primary School, Temple St Hospital, the Social Service Centre and other places in the locality has always been a big part of the life of the church and the parish. 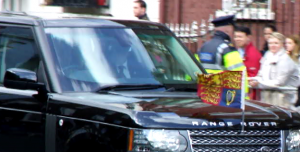 The daily programme for the 50th International Eucharistic Congress from 11th until 16th June 2012 took place in the Royal Dublin Society (RDS). Statio Orbis, the Liturgy on the final day of the 50th International Eucharistic Congress, was celebrated in Croke Park, Dublin on Sunday 17th June 2012. 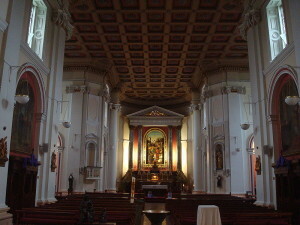 However, Gardiner Street Church played a key role in the 50th International Eucharist and played host to many thousands of international visitors. Strolling through some of Dublin streets at the begining of the 18th century, an English visitor to the city would have been met by a streetscape more remincent of Amsterdam than London. The streets would have been full of large, redbrick, gabled-fronted houses, familiar to anyone who has ever visited the Netherlands. These distinctive buildings were known as Dutch Billies and by the early 18th century they had come to dominate the city’s skyline. This makes their absence from the modern city streetscape all the more startling. Their fall from grace began in the mid to late 18th century with the arrival of a new architectural form, championed by large and wealthy developers such Luke Gardiner. This new ‘Georgian’ style of building, which is so synonymous with the modern city, rapidly replaced the earlier Dutch Billies as these were no longer deemed fashionable or desirable. However, they did not completely disappear and many still survive in the city, although often hidden behind ostensibly Georgian facades. This entry was posted in Gardiner Street Dublin History and tagged city centre accommodation, Dublin guesthouses, Dublin hostels, Dublin Hotels, Dublin pubs, Gardiner Street accommodation, Gardiner Street Dublin, Gardiner Street history. Bookmark the permalink.